When we were kids especially during summers, we have the ice cream vendor coming for his daily rounds through our streets. We used to run outside like crazy clutching a 5 rupee note in one hand tightly to get our favourite flavour. My most favourite flavours: "Rum n Raisin" and "Fig n honey"- these two flavours are to die for. Now coming to the recipe.... I heard and eaten savoury cakes and cupcakes, even chilli chocolate cake... and so I started searching for something quite different from the usual ... I got this recipe ..... Yahooooo !!! I was happy, happy, happy and without further thought I proceeded to make this one. Madhan : "What ???? Did u say ice cream??? 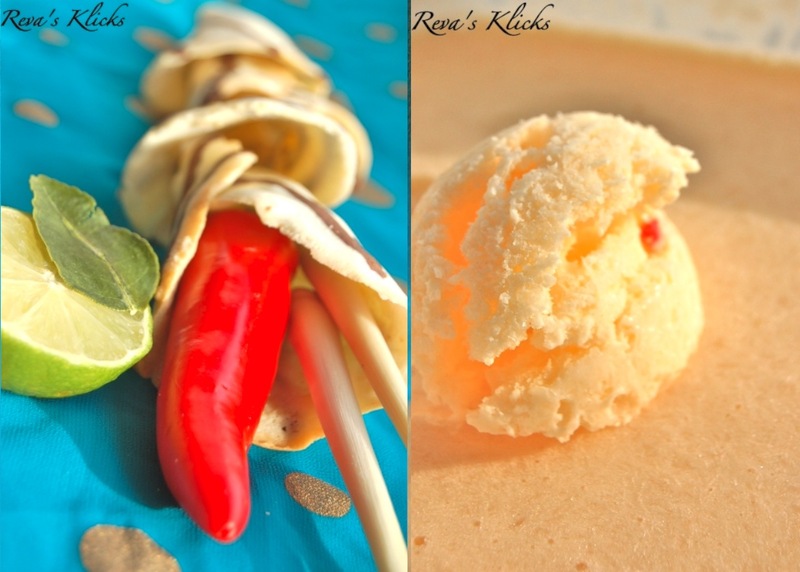 Chilli, lemon grass, lime in ice cream ?????" Reva : "Yes, u heard me right. I am making ice cream." Madhan : "Are u feeling alright"
If the ice cream is home made, then the cone should be homemade ... isn't it!!! This is a very easy recipe from one of my cookbook collection. 1.Preheat oven to 180 degrees/ 160 degrees. 2.Line an oven tray with parchment paper. Draw two circles of 10 cms circles. Grease the circles. 3.Beat the egg whites until soft peaks. 4.Add 1 tbsp of sugar at a time and beat until dissolved. 5.Once all the sugar is mixed well, stir in sifted flour, butter and extract. 6.Take 1/4 of this mix seperately and stir in sifted cocoa powder. 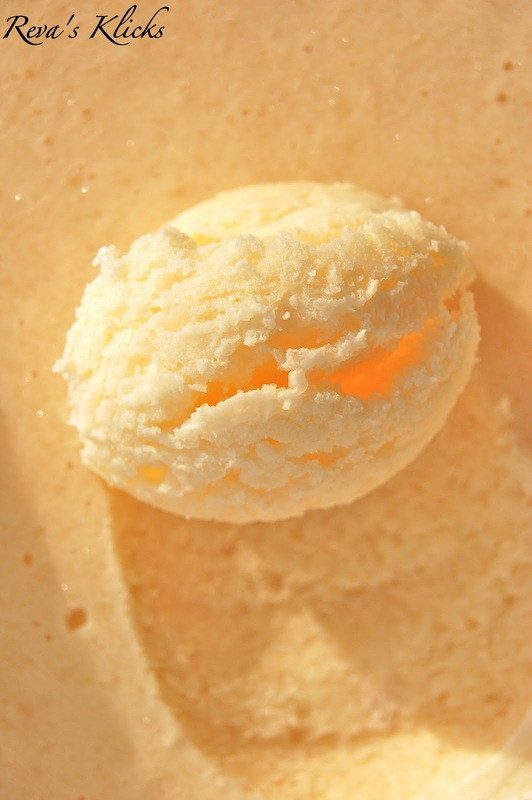 7.Spoon this into a piping bag fitted with a small plain nozzle. 8.Place about 1 tbsp of the plain mix in the center of the circle and spread evenly to fill the circles. 9.Pipe the chocolate stripes across the circles. 10.Bake for 5-6 minutes. Remove the tray from the oven. 11.Work quickly to lift the wafer from the tray and shape them into cones. 12.Cool on wire rack for 4-5 min and store in air tight container. Finish with rest of the mix. Note: This given recipe makes 8-10 cones depending upon the thickness u make the cone. It is necessary to grease the circles before each time u place the mix in the circles. Don't leave the cones in open air for more than 5-6 minutes, it soften and will not be crisp. The original recipe calls for 75 gms of sugar but I added only 50 gms [just the right amount of sweetness]. Don't pile the cones roughly. Place them next to each other in an air tight zip lock bag or a large flat tin. Even if u can't make cones, use them as wafers to garnish the ice cream when serving in a bowl. Don't be put off by the ingredients.... it is one of the most delicious of icecreams I've ever tasted.. The flavours from lemon grass and lime along with the mellow sweetness of the coconut milk takes your tired soul to tropical paradise...... and no, u will not taste the heat of the chilli. Ready made custard : 250ml. 1.Deseed the chilli and chop into tiny pieces. 2.Heat the coconut milk along with sugar and chilli. 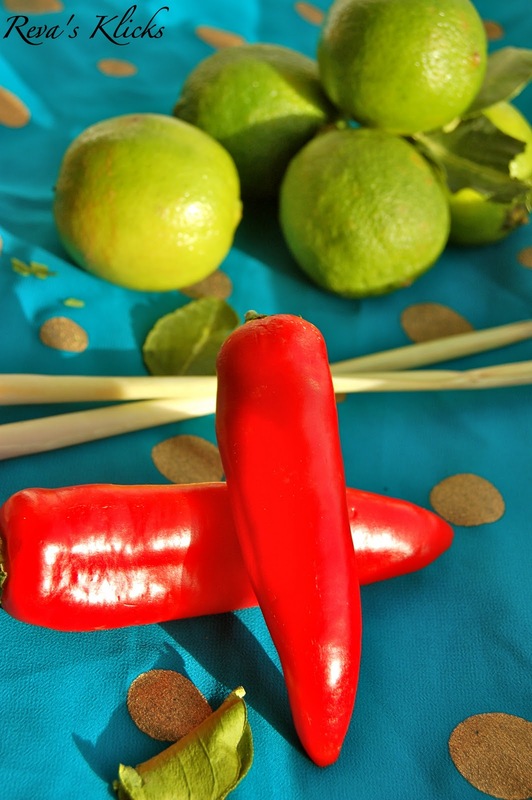 3.Once the sugar dissolves and the mix comes to a boil, add the lemon grass and lime leaves. 4.Remove from flame and leave to cool. 5.Chill for 3-4 hrs. Remove the lime leaves and lemon grass. 6.Whip the cream until it forms soft peaks. Mix with the coconut milk along with the custard. 7.Stir well and freeze until 3/4 frozen. 8.Beat the mixture well to break down any ice crystals and freeze again [I repeated the process 3 times]. 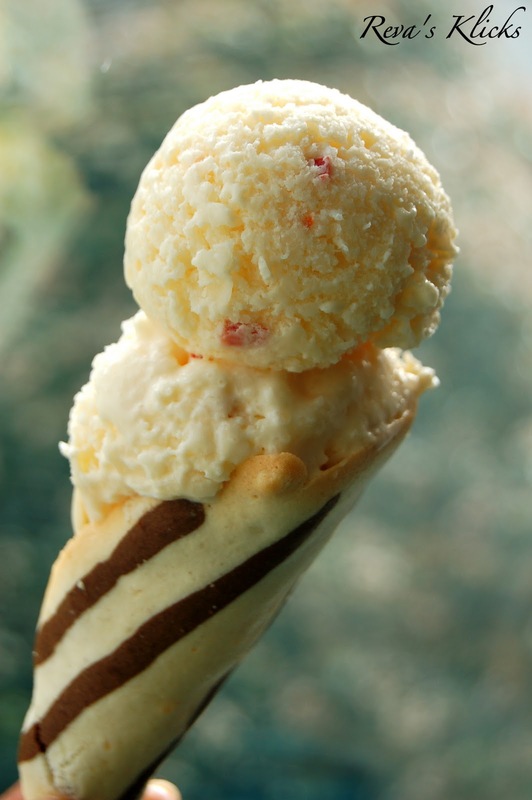 Place 1-2 scoops of this lovely ice cream on the cones and serve immediately. Than ice cream,ur daughter's happy face makes the day.How happy she is in gulping the icecream.another mile stone for u dear. Wonderful wafer cones,really tempting ice creams with home made wafer cones. Wow beautiful. Oh its pleasure to make cone ourselves in home and its easy too. Think u r little girl also helped u in eating the ice-cream very cutely. They look amazing loved it. The baby is very cute.... I am drooling over, just seeing those yummy ice-cream photos. 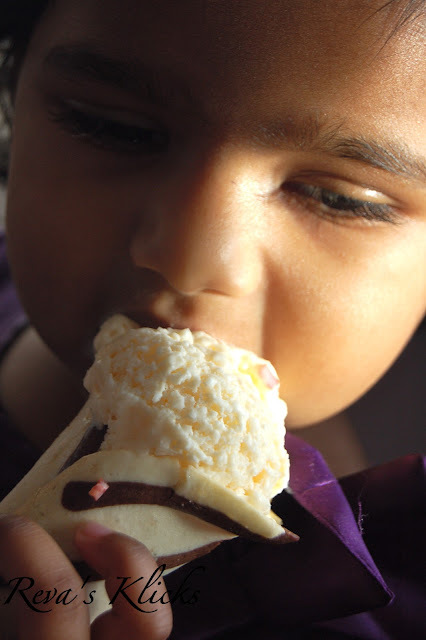 wow..awesome presentation and the ice cream looks so tempting....never thought that we can make wafers so easily at home...good job..
Chilli and icecream is one unheard combo.. Lovely clicks and your kid is soo cute..
Ice Cream looks so delicious and inviting. No doubt you little one is relishing it . Loved the decoration. Very interesting recipe. Never heard of using chilly in ice cream. Looks great...The home made wafer also looks good.. Thanks for sharing this lovely recipe & it was in my search list tooo...Baby looks so cute & that too expression! !no words. Wow ...Reva, kalakureenga..Fantastic work again.. IS the cutie ur's ?? she is simply a darling..
You went through all the trouble to make this delicious looking ice cream. Hats off! Wish I could have some of that. PS - Thanks for dropping by at my blog. First time here. You have a lovely space. Yummo spicy good ice cream. Cute pics of your daughter. Ur lil one looks like a cute baby doll, Reva u simply rocks dear, home made icecream and wafer cones u simply rocks..
wow...chillies in icecream!!! am dumbfounded :) .. interesting and tempting!!! பாப்பா அழகாக இருக்கின்றாள்...படங்கள் அனைத்துமே சூப்பர்ப்.. I don't have to thick twice before making this ice cream,as one look at that happy cutie relishing the ice cream is proof enough that this would be a hit.Like your husband I too would have had doubts if I heard only the ingredients.And wafer cones look so perfect. Excellent wafer cones, very tempting ice creams..home made wafer cones looks perfect! I can see your kid enjoying the ice cream so much..ice cream and the wafer cones are so tempting. Many thanks Reva ,for participating in my HRH event. Please collect the participation award. lovely lovely clickssssssssssssssss reva- am drooling hereeeee ! ice cream and wafer cones makes perfect companion, awesome shots ! 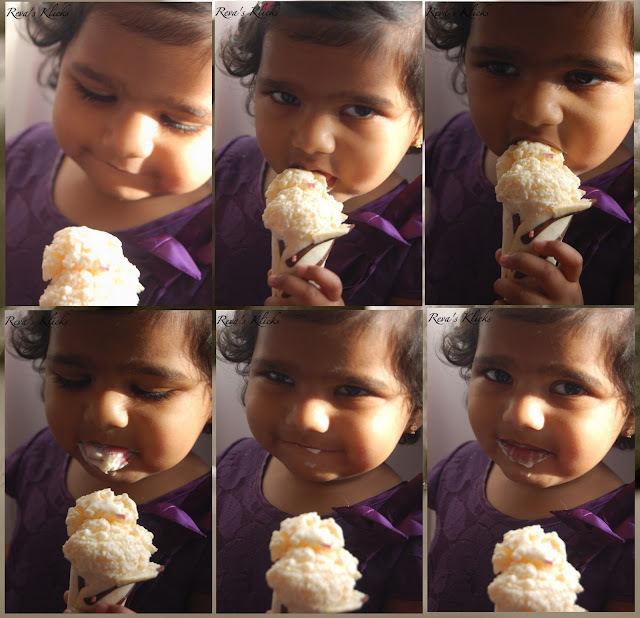 Looks so yummy ice cream...your daughter is so cute.. The ice cream look scrumptious, and the pictures are just too tempting. Love the citrus flavors in it. this is a must try recipe - on my to do list!! !